the long term financial market is known as the capital market. Short-term funds are for a period of 364 days and long term funds are for above 364 days. Chakravarthy committee (1985) for first time underlined the need of an organised money market and Vahul Committee (1987) laid the blueprint for that. Inter bank market where funds are borrowed and lent for 1 day or less. If >1 day and up to 14 days, it is called notice money. Mutual funds, scheduled commercial & cooperative banks act as both borrowers and lenders. LIC, GIC, NABARD, IDBI act only as lenders. Issued by RBI on behalf of govt. Govt uses them to meet their short-term liquidity crunch. T-bills are sovereign zero risk instruments. At present, 3 types of T-bills are there : 91-day, 182-day, 364-day. State govt can not issue T-bills. They are issued by Market Stabilization Scheme (MSS). Available for a minimum amount of Rs 25000 or in multiples of that. It's a comparatively new short-term instrument issued by RBI on behalf of Govt. Issued to meet temporary mismatches in cash flow of Govt. They resemble T-bills in character but are issued for less than 91 days only. Issued by scheduled commercial banks and other financial institutions. RRBs and local area banks can not issue CDs. Issued at a discount to face value, the discount rate is negotiated between issuer and investor. Minimum amount to be Rs 1 lac. CDs issued by banks have a maturity period: 15 days to 1 year. CDs issued by selected FIs have maturity period: 1 year to 3 years. Can be issued to individuals or firms. These are unsecured promissory* notes issued by large corporates, primary dealers, satellite dealers and all India FIs. Maturity period is between 7 days up to 1 year from date of issue. Minimum amount to be invested is Rs 5 lacs or multiples of that. The net worth for a corporate to be able to issue it is 4 crore. CPs need to have a credit rating from a credit rating agency. 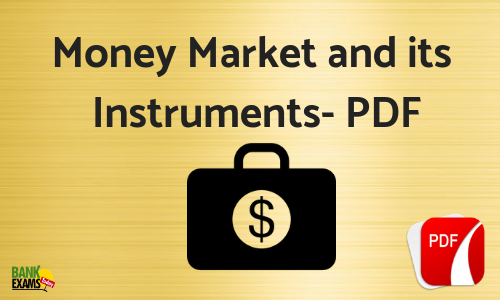 Negotiable instruments which are issued by all India FIs, NBFCs, SCBs, Merchant banks & Mutual funds. Drawn by seller on the buyer (buyer gives seller), hence also called trade bills. This is a market where corporates extend the unsecured loan to each other. Majorly used by low rated corporates for managing their funds. It is the average interest rate at which leading banks borrow or lend, estimated in London. It reflects market conditions for international funds. Approximately $350 trillion funds are tied to LIBOR as per estimates. Developed and launched by NSE in 1998. It is the weighted average interest rate at which banks/institutions in Mumbai lend in the call money market.